N.B. Redefining a pay frequency will reset all payslips. Any items that you have added to payslips as well as any scheduled future payments and deductions will be lost. THIS ACTION CANNOT BE UNDONE. 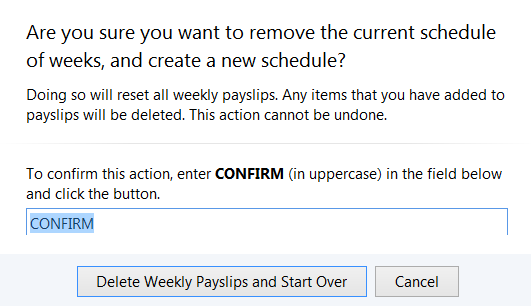 It is therefore recommended that a backup of the payroll dataset is taken before a pay frequency is re-defined. 1) Select Redefine Weeks/ Months/ Fortnights/ 4 Weekly on the menu toolbar. 3) Reset your payment schedule when prompted.